Lau Pa Sat, the hawkers haven! An old friend of me told about this hawkers nest called Lau Pa Sat Festival Market which I found very very close to the place where I attend my seminar. Thanks to my ability of reading maps easily, it was only like 10 minutes max walk from the office. If you guys wondering where, you just take the MRT to Raffles Place shelter. You gonna find tunnels interconnecting the office premises and you should walk further than Republic Plaza. I forgot the alphabetical exit (they use A-H exits to point easily where you need to get out if you happen to care reading the locality map in the shelter), but don’t take it wrong way to One Raffles Place which happens to be on the opposite site of Lau Pa Sat and there’s no way you can cross the street from there. What’s so special about this place? It’s a cheap food haven! You can find all range of cuisines available in Singapore. Mostly of course Chinese or Singaporean Chinese and Indian. You can find Padangnese cuisine in Golden Shoe nearby the other exit of Raffles Place shelter, but here it’s mostly those two main cuisines of Singapore. In extra, you might find other local food like rojak (rujak in Indonesia), kopitiam, and even Western food. It was around dinnertime when I arrived there. We were famished and my friends just order anything that they can find right away. With plenty of choices though I bet they won’t bother choosing wisely. As for me, I prefer to suppress the hunger first and take a good look about what they serve there. It’s pretty interesting to try each one of them plus Singaporeans indeed serve big portions! I didn’t know why but my mind was stick into carrot cake that night. My first experience 2 years ago sampling it was not a memorable experience but that time my relative said that if I want to seek the true Singaporean thing, it’s the carrot cake. What’s carrot cake by the way? It’s probably like what we call noodle or the one made from rice which was kway teow or kwetiau. Carrot cake was shaped long and thicker from a mixture of some kind of radish or lobak/daikon and rice. It’s chewy if you want to taste it. Then I found this one hawker called Lai Heng that actually specializes in char kway teow which was the kway teow stir fried with veggies, eggs, plus sauces that make them look a bit black. It’s actually blacker in Singapore instead of those in Indonesia. Well by the way, the dish may not look much but you gotta taste it. 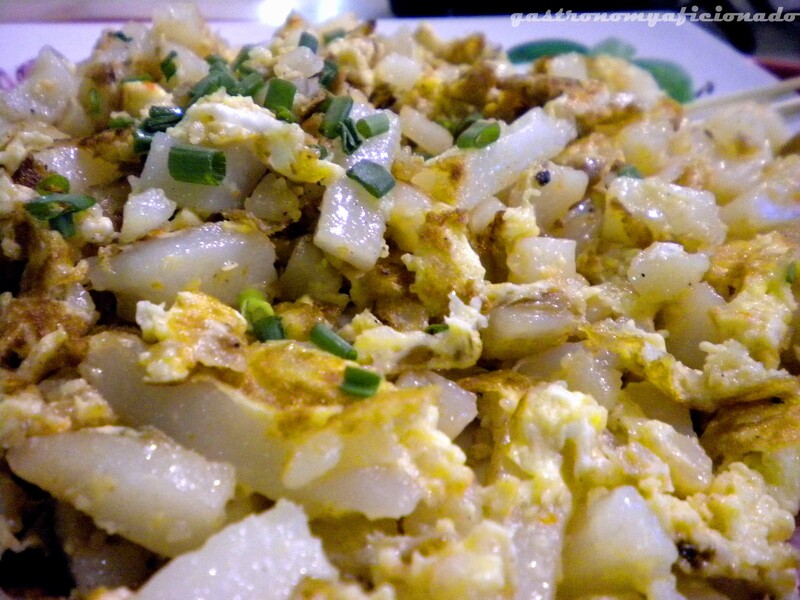 The carrot cakes were tender and they put fried eggs plus the scallions to enhance the taste. There were of course, spices used in Chinese cuisines plus the chili sauce which worked perfectly to the already divine dish. Though my first experience two years prior was bad, but this one remedies every not-so-memorable nostalgia I had with carrot cakes! I seriously beg you to try this one if you happen to be at Lau Pa Sat. The place was vast, hot though with many ceiling fans, plus that this Lai Heng hawker seems to be always crowded with quite a long queue but it’s really worth the wait! My Taiwanese friend tried the Char Kway Teow but he said that it’s not that good. Perhaps I shouldn’t trust much people with untrustworthy tongue and passion about food, so next time I’d really try all the dishes they offer. Next time, Lau Pa Sat! 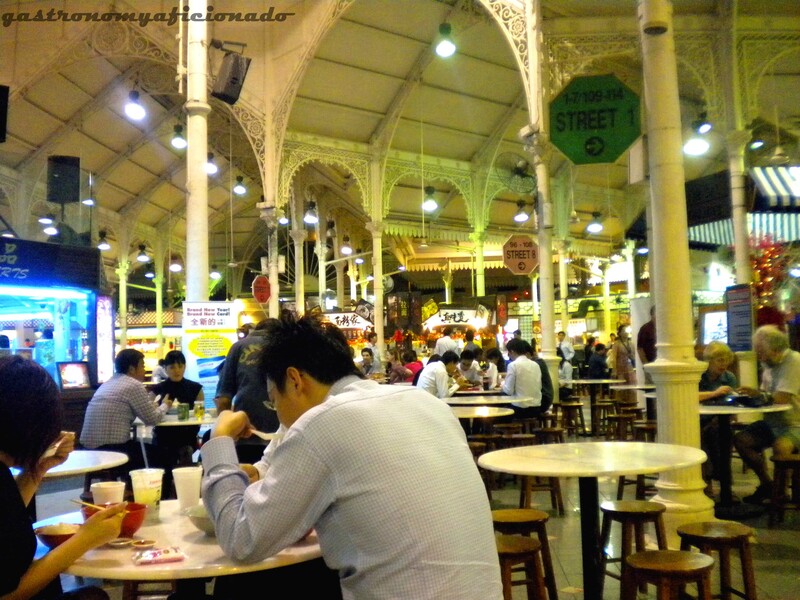 Lau Pa Sat Festival Market hawkers food court near Raffles Place MRT, Singapore. Just take the underground tunnel to the farthest exit after One Raffles Place, once on surface turn right after the Ascott Hotel, walk straight and cross the street, you’ll find the big sign by the way.